I've got some seeds I want to start indoors but there's no need to buy a seed starter kit from the big box store. 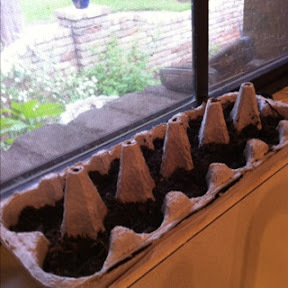 Take a used paper egg carton, cut off the top (to be used as a 'saucer' underneath the bottom part), fill the 12 sections with dirt, plant seeds and put on a windowsill. Water daily. When the seedlings are ready to go in the ground, cut the 12 sections apart and plant the entire section. nice info for people with 'black thumbs' like myself - Ihope people with working knees and hips read this and are inspired!